Small businesses have a tendency of ignoring human resources until there is a problem. It’s incorrect to assume that smaller organizations are immune to HR challenges because of their size. Smaller businesses are actually at an even greater risk because they often don’t see the magnitude of the problem until it’s too late. 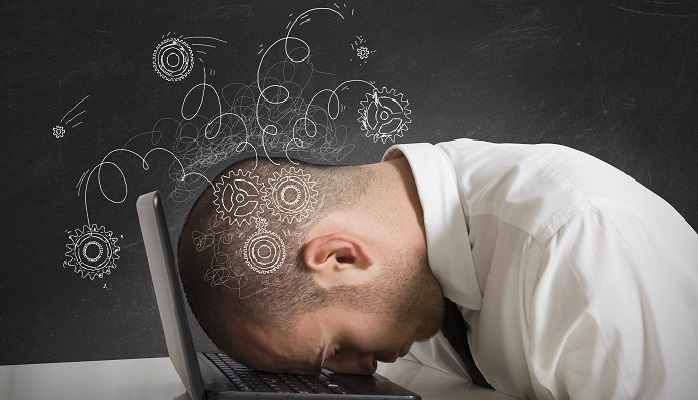 At first glance, you may think all this HR stuff seems like a big headache. Well to be honest, it is. But turning a blind eye to it can be a costly mistake. These unaddressed people issues are the main cause for high employee turnover, fines, and legal complications. Your business is growing quickly, and you feel like you desperately need to fill a position right now! These knee jerk reactions will only lead to costly hiring mistakes in the end. Bad hires carry a hefty cost of anywhere between 30% and 150% of the person’s salary. A much bigger concern than replacement fees are the indirect costs and the impact on your remaining staff. In a recent study by Robert Half, 41% of CFOs interviewed believe that lower morale and lost productivity are the biggest risks to their businesses when a hire goes wrong. Invest the Time Needed: Poor hires are usually the result of managers not investing enough time in the hiring process. If you or your managers don’t have the time to commit to the hiring project then delay it until you do. Prepare a Job Description and Posting: A solid job description is a critical first step to hiring the right person. Create a job description that clearly lists all the mandatory responsibilities and accountabilities for the position. From the job description write an enticing job advertisement that speaks to your ideal candidate. Only interview people that meet your mandatory requirements. Cultural Fit: “Fit” is an often overlooked when hiring but is as important as skills. Even if you find the perfect candidate ‘on paper’, if they don’t play nice with your current staff then they won’t work out in the long run. Your team will potentially work beside this person every day, so involve them in your hiring decisions whenever possible. Due Diligence: Once you select your ideal candidate, and before extending an offer of employment, do your due diligence and check them out. Many small businesses don’t conduct reference or background checks because they feel it’s a waste of time. You’d be surprised how often you come across a poor reference that brings to light an issue with a candidate. It’s worth getting the facts ahead of time, instead of being blind-sighted by ‘surprises’ later. A reputable background-screening provider should be used to check for criminal record, credit, education and employment verification. Only do background checks that are relevant to the position. Privacy legislation has specific requirements for obtaining consent, collection, and use of private information. Your provincial Human Rights legislation will provide more information on these restrictions. HR policies and employee handbooks. You may be thinking that you are too small to need policies and that employment laws and regulations aren’t as strict for the little guy. Wrong! Regardless of the size of your organization there are specific policies that you MUST have in place to be compliant. Health and Safety Policy. Each province has legislation for Health and Safety in the workplace. 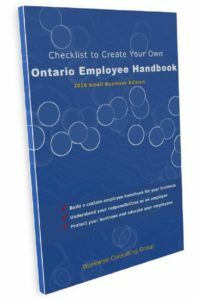 For example, in Ontario the Occupational Health and Safety Act stipulates that an employer with six or more workers is required to have a written policy. On July 1, 2014, the Ministry of Labour made Health and Safety training mandatory for workers and supervisors covered under the Act. Workplace Violence and Bullying Policy. In 2010, Ontario Health and Safety Act, Bill 168 Anti-Bullying legislation was passed making it compulsory for employers to have policies for workplace violence and bullying. Discrimination and Harassment Policy. Employment contracts and policies must conform to human rights legislation (such as, Ontario Human Rights Code). Accessibility Policy. The Accessibility for Ontarians with Disabilities Act (AODA) mandates that employers with 1- 49 employees are required to have Accessibility Policies in place by January 2015. Those employers with more than 50 employees are required to have policies in place by January 2014. There are other additional requirements under this Act that are being phased in over the next several years. Along with the above policies, the Ministry of Labour website lists the mandatory posting requirements. Additional policies such as code of conduct, use of technology, employee relations and terms of employment can also protect your business. Performance problems NOT addressed or documented. Documenting performance problems is rarely done consistently. If performance problems result in termination, there is always a risk of a lawsuit. You always have documentation to support your decision to dismiss an employee. You may be thinking that since an employer can dismiss an employee at any time without just cause if they provide reasonable notice, why should you bother taking the time to address and document the problem? Two reasons: your reputation and your remaining employees. Give Regular Feedback. Every employee has the right to know when they’re not performing up to company standards and to be given a chance to correct their behaviour. These conversations can be difficult, but are unavoidable and need to be dealt with head-on. Our article entitled “5 Tips to Giving Constructive Feedback” will help your prepare for these conversations. Document. There is far too much going on in your daily business to leave anything to memory. Document all performance conversations you have with employees even if it’s just a quick note in their file. Your reputation. Consider for a second how not addressing these issues can be damaging to both your external and internal reputation. What message do you send to your remaining employees when you terminate someone without addressing their performance problems? The message is loud and clear, “If you don’t performance…you’re toast, no chance to improve or resolve a situation.” These actions breed a toxic workplace built on fear, not trust. Many small businesses don’t want to invest in training for two main reasons. First, fear of losing their employees once they gain additional knowledge, and second, the perceived high costs of training. In the article, “9 things bosses do that make great employees quit” Travis Bradberry says that failing to develop people’s skills is a sure way to lose your top people to your competition. Training opportunities are an investment in your company, and they don’t necessarily have to cost you a fortune. It could be as simple as an internal stretch project to give the employee a chance to hone new skills. Your company may be qualified for the new government grant called The Canada Job Grant. Eligible employers can receive funds up to $10,000 per person or 66% of eligible training costs per employee. A contractor that is actually full-time employees. You may prefer to hire your workers as independent contractors rather than full-time employees to save money on benefits, pensions and payroll taxes. But, even if you have a signed agreement that states that the person is a contractor, your relationship may still be considered an employee/employer arrangement. Determine the nature of the relationship: Various tests have been developed by the courts to determine whether a relationship is a contract or employment arrangement. There are three broad areas; the following questions will help you determine the nature of your relationship. CONTROL – Does the worker have control over the amount, nature and how the work is done? Is the person given an objective and then they have the freedom to decide how to obtain the desired outcome? FINANCIAL – Does person provide their equipment, workspace, supplies, learning material, and tools? Is the person at risk of losing money if their costs exceed the amount they charge for the services rendered? Does the person invoice you for their services? RELATIONSHIP – Is the person excluded from benefits, pensions, vacation pay or other employee perks? If you answer NO to most of these questions, your independent contractor would likely be considered an employee. During a Canada Revenue Agency (CRA) audit they will determine whether the relationship is an employee, or a self-employed contractor. If the CRA establishes that an employee/employer relationship does exist you will be fined both portions of CPP and EI contributions, interest and penalties on the assessed amount retroactively. Human resources can be a challenge for small businesses that lack experience in employment laws and employee management. But, by focusing on these five areas your company will make better hires, safeguard against lawsuits, and improve your employee engagement. Question: Is there other business mistakes you’ve made? How did you fix them? Please leave your comments below.